In news that seems like a perfect metaphor for a zombie show, AMC has teased that it’s working on a plan to keep The Walking Dead going—in one form or another—forever. 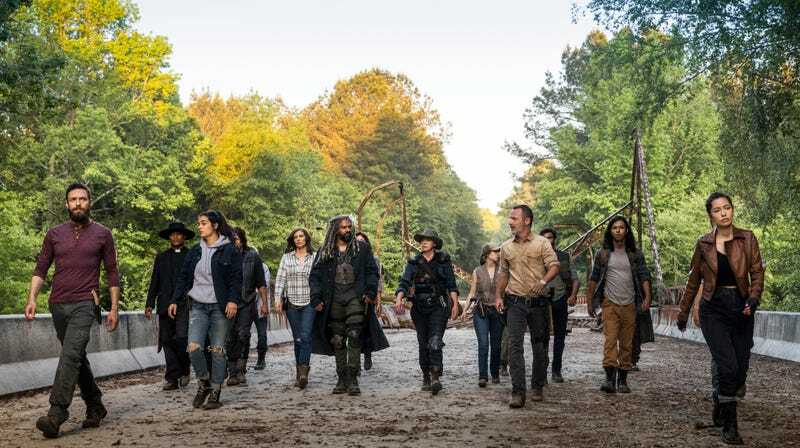 That comes from Bloomberg, which says AMC is talking with “several large media companies” about plans to keep The Walking Dead brand alive for “another 10 years.” Nothing has been set in stone yet, but AMC apparently “wants to produce several movies for a TV network or streaming service that could spin off into different series,” with one possibility being to take the series to a different country (The Walking Dead is also a big hit outside of the U.S., naturally). The Walking Dead is currently exclusive to Netflix and Fear The Walking Dead is exclusive to Hulu, but Bloomberg says AMC has been telling these “large media companies” that all rights are “on the table.” That means whoever decides to get on board with AMC’s plan to make a bunch of Walking Dead movies (and spin-offs from those movies) might also get the lucrative rights to the existing two shows as well. There’s also a chance AMC might not partner with a large media company at all, since the network would like to hold onto its complete control of The Walking Dead, but that seems like the riskiest option by far. After all, The Walking Dead isn’t the ratings monster it once was, so it would be an odd choice for AMC to start pushing entirely new shows and spin-off movies when people aren’t even as thrilled with the main series as they used to be.